Whereas California has been getting drenched by El Niño, and the East Coast is finally done digging out from winter storm Jonas, here in the Pacific Northwest, we've simply been dealing with a sightly chilly, very, very rainy winter for the past few months. Like most of you, I'm sure, cool, wet weather makes me want to bundle up in warm and cozy clothing. 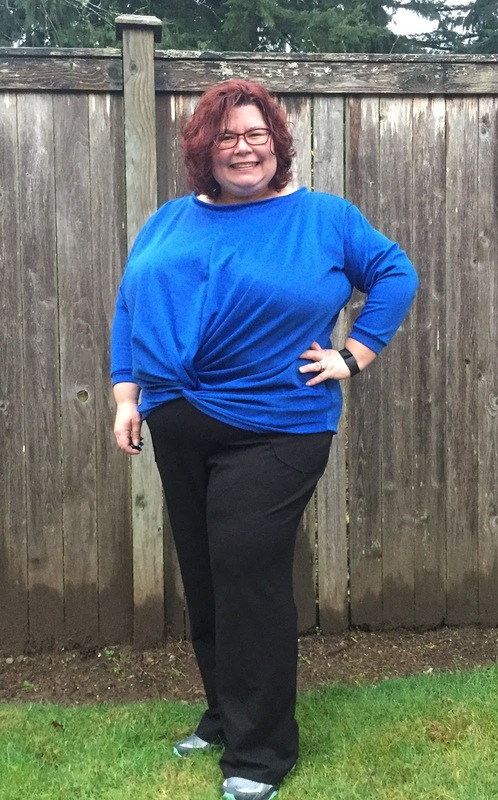 After enduring many rainy weekends this winter, I decided to treat myself to a new lounge/ athleisure outfit for my Fabric Mart project this month. First up are a pair of SBCC Pinot Pants, a yoga-style pull-on pant drafted specifically for petite women. If you're not familiar with SBCC patterns, they're designed for women 5'3" and under and use separate draft blocks for misses' and plus sizes. 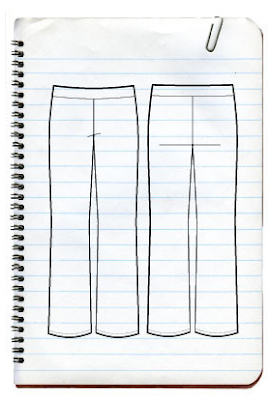 The size range for the Pinot Pants goes from a 32" hip (81cm) up to a 56" (142 cm) hip measurement. For my version, I used one of the many Ponte knits available from Fabric Mart. The exact ponte that I used appears to be now sold out, but it's black in color and is a rayon, nylon, and lycra blend. 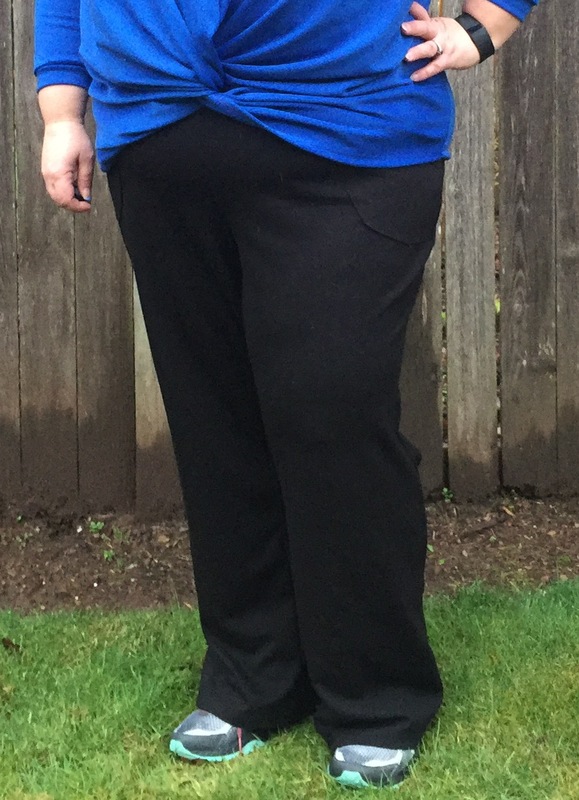 It's been a dream to wear and has been holding up quite well in the wash.
Based on the SBCC size chart, I sewed this pair in a size 2X. 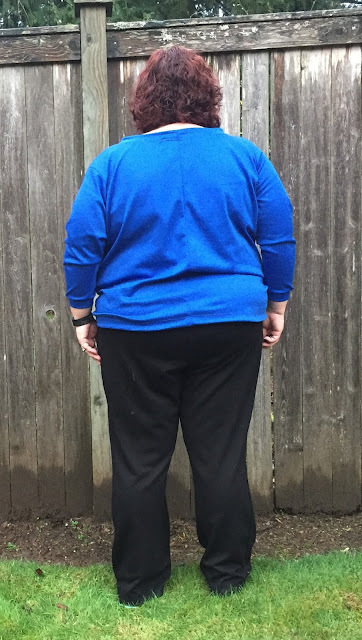 I do feel like these run a little large, at least in the plus size block, in that I was expecting them to be a little more fitted through the hips and thighs. However, I certainly think that they look fine and will be getting a lot of use out of them--just not quite as fitted in some areas as I was expecting. What's great about these pants is that with me being only 5'2" tall, I didn't have to shorten the legs or the rise at all. (I did add 1" to the CB seam, which is a common alteration for me to provide more vertical coverage over my ample rear end.) The pant legs do have a slight flare to them, so if you're short like me, there's no worrying about shortening your pant legs in multiple places or trying to figure out where the flare starts to preserve its look or anything. The pockets do not gape at all while being worn and are large enough to easily and securely hold my phone. I'm quite happy with how these pants turned out, and I can definitely see using this pattern in the future as a TNT pattern whenever I want to whip up a pair of athleisure pants. My second piece this month is the relatively new HotPatterns Athleisure Pretzel Sweatshirt. The HP Pretzel sweatshirt is a relaxed-fitting sweatshirt designed for medium-weight drapey knits. For my take on this pattern, I used this cobalt blue Ponte knit, which still has some yardage available. 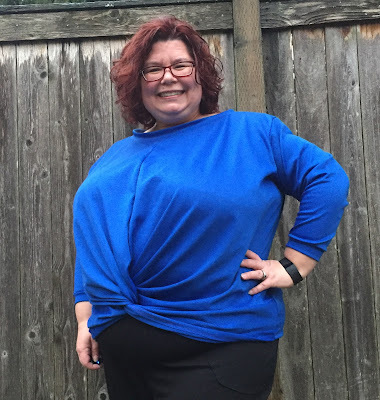 I think that ponte was a great choice for this pattern; it's hefty enough to make the sweatshirt feel cozy, but has enough drape to really show off the twist detail at the hem. Per the size chart and my previous experience with HotPatterns, I sewed a size 18 through the neck and shoulders, grading out to a size to through the bust, waist, and hips. The final sweatshirt fits as expected. You know how some projects are just fun to sew? They go together quickly without any real tricky bits or drama, but have some sort of design detail that elevates them above being completely basic? This is one of those projects. I was able to construct the entire top on my serger/coverstitch combo machine, and I was able to complete the sweatshirt in about 2.5 hours (including fabric cutting time). The twist detail at the hem is fun and elevates this sweatshirt over your basic sweatshirt pattern. The pattern also includes suggestions for contrast top-stitching (which I omitted). Overall, I love my new outfit! It's both comfortable and practical for the mom-on-the-go role that I take on over weekends, and it's also warm and cozy for lounging around the house on a rainy day with the fireplace on. Excellent job! You're definitely doing cute and casual right! I like the sweatshirt. That twist at the hem is much more flattering than a band, isn't it? Great use of color. You look cute, warm, and happy. Love the shape of that sweatshirt! Thanks for posting about Hot Patterns (I discovered them through your blog). I have had a lot of fun with the different construction techniques I've learned from HP patterns. I love your outfit! You look fun and happy and stylish.